A new design in our Fabulous bed of roses round. 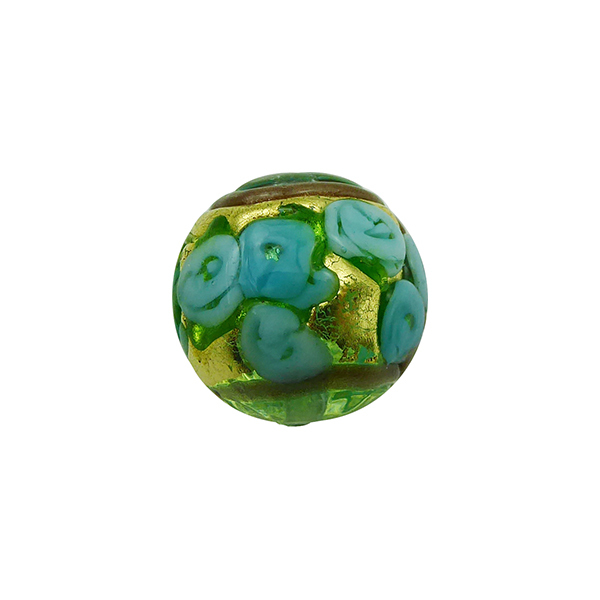 Complex authentic lampwork Murano glass bead with a base of transparent Acqua Chiarissima, a very pale Aqua Murano Glass and on top drawn in melting glass little roses and decorations and splashes of 24kt gold foil. The . Size is approximately 14mm in diameter round. Note that there may be bubbles in the clear glass used in the overlay. This is normal and not a defect. No two ever exactly alike. These match with our larger Bed of Roses discs. The size is approximately 14mm with a 1mm hole through the center.